Location: Gingelom, province of Limburg, Belgium. Notes: Hasselbroek Castle (Dutch: Kasteel van Hasselbroek), also Hasselbrouck Castle (French: Château de Hasselbrouck) is a 17th-century country house in Hasselbroek, in Jeuk, a part of the municipality of Gingelom, province of Limburg, Belgium. The building was constructed in a U-shape. The right wing in Maasland Renaissance style dates from 1620. 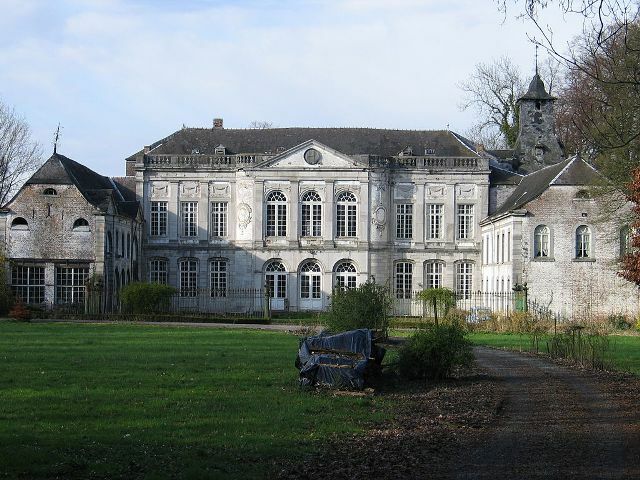 Architect Jacques Barthelemy Renoz, born in Liège (1729–1786) built the neoclassical wing main building in 1770. The left wing was for the use of dependencies. The castle was built by the Bormans van Hasselbroek family. Jean-Henri Bormans of Hasselblad Broek (1706–1774) undertook a variety of expansions and improvements. He was personal advisor to Prince-Bishop Franciscus Karel de Velbrück. Architect Jacques Barthelemy Renoz, born in Liège (1729–1786) built the neoclassical wing in 1770. Nowadays the Castle remains privately owned and is under renovation since a few years. The aim is to give the Castle all the style it used to have in the past and also to welcome some artists and exhibitions. More recently, thanks to the Mezo Art foundation, artistic performances are held in the Castle and some movies, commercials, photoshoots and exhibition have taken place and still happens nowadays. Finally, the Belgian contemporary artist Augustin S., member of the family who owns the Castle, has find a place to develop his art and is inspired by this beautiful environment as well as the fashion brand VERCOUR that has established its headquarter in a part of the building.